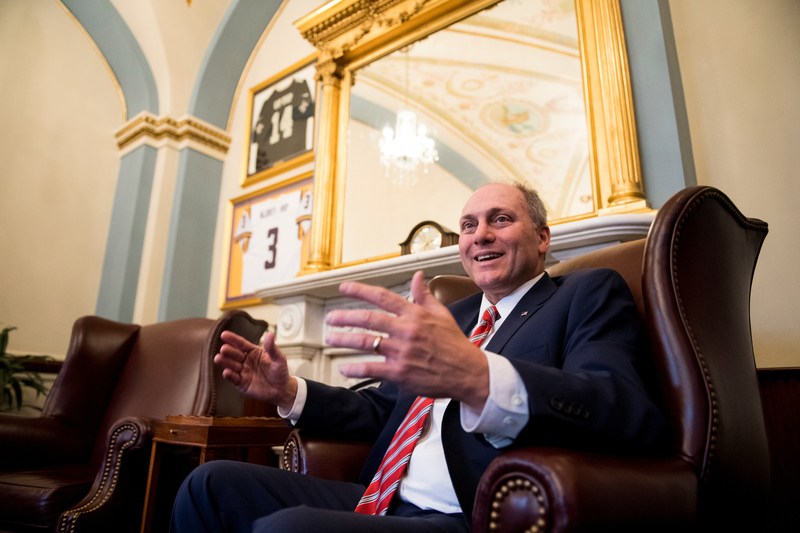 House Majority Whip Steve Scalise, 52, a Louisiana Republican, talks about preparing for the next Congressional Baseball Game after last year’s shooting, his physical therapy and advice he gives to other victims of gun violence. Q: Are you doing anything in particular to get in shape for baseball? A: We started to do some exercises to practice fielding a ball. Getting my balance back was one of the biggest things I had to work on right after I was out of all of my surgeries. I’m trying to field now. They did some practices where they’d roll a ball to me, and I’d kind of bend down and pick it up and throw it. I was able to start doing that. She started bringing out some medicine ball drills so I could practice moving around and not just walking in one direction, where I can reach for something without falling over. Q: What else are you doing for physical therapy? A: I do three days a week of physical therapy as part of my recovery from the shooting. I’ve still got a lot of leg damage, nerve damage. My muscles are still real slow to come back, so I’m doing a lot of work to try to build that back up. And they give you real specific things to do. The “Geaux Cart” [a motorized scooter], as we called it, I finally retired that. I was using that for longer distances around here. I’m able to get around now just on crutches. My physical therapist would like me to get to a point where I get down to one crutch and [then] no crutches. I look forward to that, too. I’m just not ready for it. Q: What do you think your role will be on the team? A: I want to first go out and compete for my starting job at second base again. I had earned that spot. It was years before I was able to unseat [Rep. Kevin] Brady, back in 2016, to get the starting job, and in 2017 I was going to be the starting second baseman again. Got sidelined, so I’ll go out and see what I can do. Ultimately, I want the team to win. We won the last time I played, as I tell [Democratic Rep.] Cedric Richmond. I’m out for the 2017 game, and he wins again. It’s time that we flip it back around. Q: You met with Parkland high school students. What advice did you give them? A: What I talked to them about is that they’ve been through a devastating tragedy. Everybody’s going to have a different level of grief and how they cope with it. The biggest thing is just to talk among your friends. It’s going to hit them all differently, but ultimately when they start to deal with the grief from the tragedy, don’t do it alone. Talk to your friends that went through the same thing. Me and the other members of the baseball team talked a lot about the experiences we went through. I’ve talked with my security detail a lot about what we went through. Q: In the time you were gone, did you notice any big changes around here? Pet peeve: People who don’t have the patience to see things through. If you could have dinner with one person, living or dead: Jesus Christ, Ronald Reagan. Living, Bono. Closest friend across the aisle: Rep. Henry Cuellar.